There are very few Hindi novels that I have reviewed, and none of them left such a deep impact on me as Half Widow. 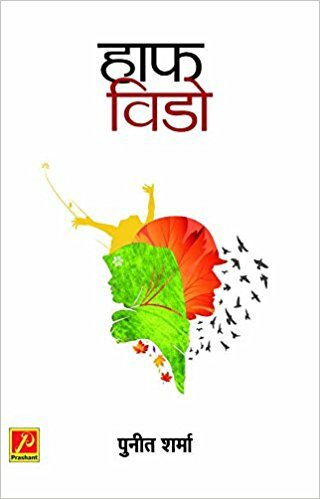 Initially, I felt that the book penned by Punit Sharma, would be just another love saga, depicting much pain and suffering. The simple yet vibrant cover page further strengthened this belief of mine. But as I went on to read the preface, I discovered that the book was going to unravel some of the harshest realities about one of the most burning topics in India, namely Kashmir. Benazir lives a happy though poverty ridden life with her husband Afraaz, who rows a boat to earn a living. Then Benazir develops an eye condition that threatens to take away her vision, and Afraaz becomes desperate to prevent this by ensuring her proper treatment. That is when Afraaz meets Raahi, a highly religious man who seems eager to help the couple. He convinces Afraaz about being a man of God, who is destined to play a vital role in the fight for Kashmir’s independence. A misguided Afraaz helps move arsenal and is unwittingly assisted in the act by a armed personnel. But, soon after Afraaz is arrested and as he awaits his fate in the Army Jail, Benazir is left to fend for herself while living the life of a half-widow. Half-widow is a moving tale of love, sacrifice, treachery, dirty politics and above all the miserable life led by countless women in the valley of Kashmir. It also highlights the plight of the masses, who, are on one side oppressed by the law makers and on the other taken for a ride by their own brethren in the name of religion. I congratulate Punit for having the strength and the willingness to present the darker aspects of Kashmir in such an emotionally gripping tale and wish him great success with it.